Texas Governor Greg Abbott vetoed an estimated $193,000 annual membership to the Southern Regional Education Board (SREB) as part of the state’s discretionary spending budget last month. This line-item veto is part of a political tug-of-war with Legislative Budget Board (LBB) bureaucrat Ursula Parks, who took exception to Abbott’s overall veto. Breitbart Texas analyzed these issues in depth. In 2012, House Speaker Joe Straus and former Lt. Gov. David Dewhurst appointed Parks to her director’s post. Abbott’s veto was consistent with his anti-Common Core stance. He objected to the Lone Star state’s involvement because the 16-state consortium supports the Common Core curriculum effort. Texas is one of two SREB members that did not adopt Common Core. SREB funders include Common Core partners Bill & Melinda Gates Foundation, Pearson Foundation, U.S. Department of Education and the Alfred P. Sloan Foundation, among others. They drive policies pre-K to Ph.D. on federal and state levels but also work directly with schools to further the national college and career machine and the newly popular gap-closing career and technical “middle-skills” agenda. Last year, SREB developed math and literacy ready courses for education lobbyist, the Texas Association of School Administrators (TASA). Like other Big Education entities, they hold conferences chockful of Common Core. They also research, collect and analyze data plus pump out reports like Embedding the Common Core State Standards or Other Rigorous Standards into Academic, Career/Technical and Elective Courses. They lobby Congress on behalf of their members. SREB President Dave Spence insisted to the Texas Tribune that his group had no Common Core connection, even though he wrote a Fed Led education policy series with grant money from Common Core riddled Gates and Lumina foundations. Spence also claimed that SREB planned to pump over $4 million dollars into Texas teacher development over the next four years. 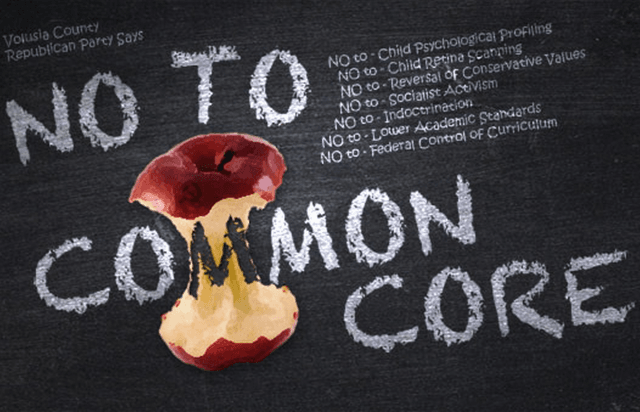 Abbott’s current Keep Common Core Out of Texas petition is in response to the LBB opposition. “I vetoed funds for a board that supports Common Core. Bureaucrats are protesting,” he posted to Facebook. The LBB seeks to reinstate and fund the SREB. On the campaign trail last year, Abbott signaled he would “crush Common Core” and “end Common Core,” espousing values that came from a belief in genuine local control of education, empowering parents, teachers and principals to serve the state’s students, a spokesman told Breitbart Texas. As Texas Attorney General, he rendered a response to an opinion requested by then Sen. Dan Patrick. Abbott said: “No Common Core in Texas” and he emphasized the intent of anti-Common Core legislation was “not to prevent the use of materials where the two standards overlap; it was to prohibit the outright adoption of the national Common Core standards.” Patrick is now the Texas Lt. Governor and has oversight over the LBB. Still, Common Core materials continue to creep in and remain a sore spot among Texans. One way to stifle that creep is to end the taxpayers’ involvement with a consortium that supports the Common Core. Rep. Jimmie Don Aycock, the lead author of House Bill 5, the law may well give Texas a lot of its Common Core-like feel, was quick to cough up wild ideas of Tea Party conspiracies to the Tribune when it came to Abbott’s SREB membership veto. Yet, Aycock and State Board of Education member Thomas Ratliff told an Austin audience about the behind-the-scenes tactics with mom lobbyist group TAMSA that went into passing HB 5 in 2013, which Breitbart Texas reported.